A crackling fire heats a pile of rocks in a village in Baliem Valley under the Jayawijaya mountain range. The Lani people in Yonggime village are getting ready for a feast. 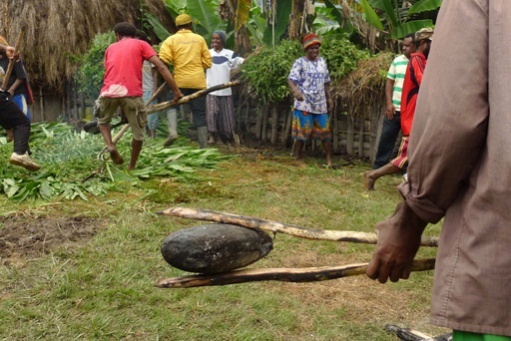 Bakar batu (rock burning) is an age old ritual in Papuan tribes. The indigenous Papuans perform the ritual on various occasions: the harvest, after a conflict resolution, a funeral, to name a few. It’s an earthy cooking method where vegetables (and sometimes game) are cooked with the heat of hot rocks placed in a hole in the ground covered by leaves and grass. In Yonggime village in Jayawijaya’s Baliem Valley, the atmosphere is festive. They are performing the rock burning ritual to celebrate the sweet potato harvest. The people work with amazing efficiency. They shout to each other in their melodic Lani language. The ritual looks like a dance that requires cooperation and trust. Everyone moves fluidly. The men dig a hole in the ground and heat the rocks on a wooden platform. The women bring in the sweet potatoes in their traditional woven noken bags. When the hole is ready, the men and some women move the hot rocks with a forked stick. Amazingly, no one bumped into each other or got burned. The village is more than just a group of people. In this dance, they are a gestalt. 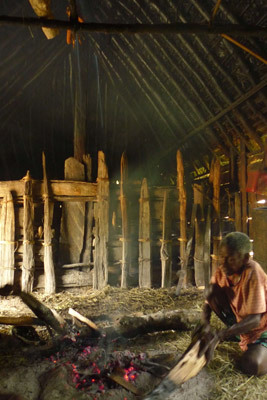 Keeping warm: An old Papuan lady tends to a fire inside a traditional Papuan house. 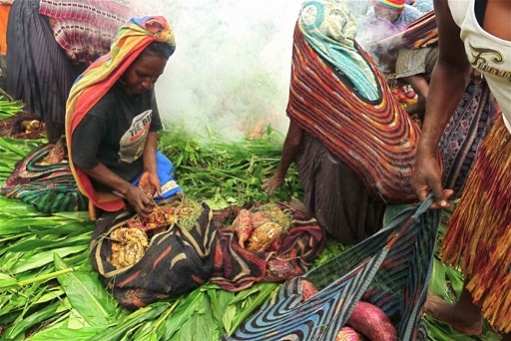 Smoking: Women arrange sweet potatoes in the cooking pit. Under the grass and leaves are hot stones. Rolling the stones: Yonggime village women and men place hot stones on a pit covered by grass and leaves to prepare their earth oven. Baggage off: A woman opens her noken, a traditional Papuan woven bag, filled with sweet potatoes next to the cooking pit, while other women bring their noken closer to the pit. 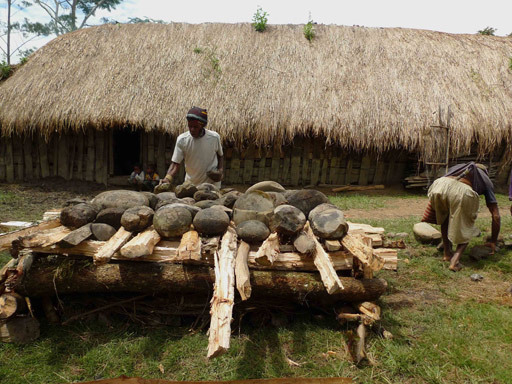 Don’t leave any behind: A man arranges stones above a wooden platform while another man squats to pick up stones. The stones will be heated up by setting the logs on fire. Papua province, Indonesia’s easternmost territory, is so far from the country’s capital — geographically, culturally and historically — that many people in Jakarta have little understanding of what life is truly like on the faraway island. Development worker Mitu M Prie has had the opportunity to live and work in both Jakarta and Papua during the last 10 years. Working on public health campaigns, she travels to the highlands of Papua, crosses the deep and often choppy waters of Lake Sentani, plunges her feet onto the beaches in Beiji and looks out to the Pacific from Jayapura. There, she meets Papuan people, learns their languages and falls in love. Mitu travels with her several cameras. There are professional SLRs and small point-and-shoot pocket cameras. Everywhere she goes, whether to the markets, the soccer fields, the airports and seaports, the hills and the beaches, she captures the faces of contemporary Papua. Her pictures are rich in human emotions, against a backdrop of majestic Melanesian nature. 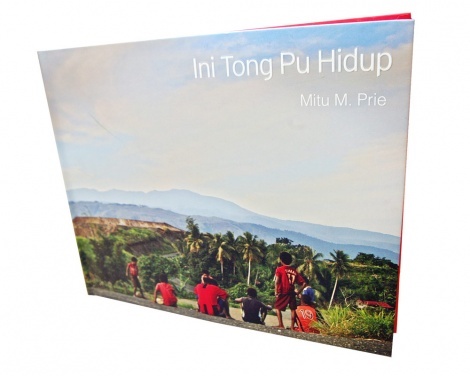 Neles Tebay, a Papuan human rights activist and rector of the Fajar Timur school of philosophy writes in an introduction to Mitu’s book of collected photos from Papua, that “[S]he looks at Papua through the eyes of love”. “Viewing Papuans without love is to treat them like an enemy,” he writes. And that was what Mitu aimed to break through with the photographs that she took, which are collected in the book, Ini Tong Pu Hidup (This is the Life We Live). “I want people to support, to love and to know, so that the gap of [knowledge] will be narrowed. And the stories that come from there are not only from irresponsible parties,” she said at the Cemara Gallery in Central Jakarta, where her photos were being exhibited in early August. “Many of us here have an unkind tendency [toward Papuans] because we don’t know them,” she said. Papua continues to be the most impoverished province in Indonesia, despite being home to the world’s largest gold mine. Years of conflict in the region from the military operation in the 1960s that officially placed Papua into the territory of Indonesia and decades of resource looting have left deep wounds. Reports show that military operations hunting down so-called “separatists” have forced many Papuans to flee to the forests as their villages were razed to the ground. “There is anger but, it’s not only political grief; simple cultural ignorance is also one of the factors,” Mitu said. She added that there was once a family planning campaign that utilized the same teaching materials aimed at Javanese culture, with Malay models on the posters, depicting life in urban Java. Unsurprisingly, the campaign failed and did not go down well with the locals, she said. Her encounters with Papuans have often resulted in their becoming annoyed, as Muti hails from Java. “Sometimes, I’m like a representation from here [Java]. I’m ready to be scolded and I gladly take it,” she said. Her book includes forewords from academics. Apart from Tebay’s essay, there is a detailed history of Papua by Agapitus E Durmatubun, a lecturer in the school of anthropology at Cendrawasih University in Jayapura. Durmatubun provides an interesting read about Papua, from the geographical information of the island — “The island of Papua is shaped like a giant bird, of which 47 percent consisting of the bird’s head, nape, neck, back, breast and belly is the territory of Papua” — to the history of Papua’s name, which means “curly” from the Malay word, pua-pua. But the pictures speak for themselves. Local Papuans take three-wheeled Javanesse-style becak around Wamena in one of her pictures. In another, youths sporting rasta hairstyles smile into the camera. There are also little boys preparing for a soccer game in a field overlooking a great mountain range in the highlands. Tak kenal maka tak sayang (if you don’t know it, you can’t love it); so goes an old proverb. Mitu has traveled to get to know Papuans and her love shows through the pictures that she takes. Her book can be a tool for people to get to know the many faces of Papuan people and fall in love with them as Mitu did. As with many areas in Indonesia and around the world, people in Papua move from rural areas to the city. However, having lived close to their land for thousands of years their competitive streak in setting up small businesses lags behind that of migrants who have for generations had the skills to run businesses, according to Rio Pangemanan, Oxfam program manager on the Papua Enterprise Development Program. In no corner of the town of Wamena will one see a shop that is owned or run by indigenous Papuans. Indigenous women with their noken (traditional Papuan woven bags) hanging from their heads to their backs sell sweet potatoes or vegetables on a cloth in the street markets. Young strong-limbed Papuan men push rickshaws, some even in bare feet. Others wander around the markets, intoxicated from glue-sniffing. UK based international development organization Oxfam is currently the only international NGO that is allowed to operate in the heavily policed province. Working with local partners, Oxfam has been supporting local farmers in five regencies in Papua in developing their farms and markets. Oxfam supports the farmers according to the local needs and potential. For example, in Yapen Island, Oxfam has supported the Wamanuam Be Kitabono Yawa (WMY) Cooperative in cultivating vanilla beans. In Jayawijaya regency, the NGO has supported the Independent Business Foundation (Yapum) in cultivating and distributing sweet potatoes. Meanwhile in Paniai and Nabire Oxfam has supported their local partners in helping coffee farmers and in Jayapura, cacao farmers. Oxfam’s contract ends next year, but Rio hopes that the NGO will get an extension for its programs. Rio said of the vanilla program in Serui that vanilla vines needed three years to produce beans, so new farmers would only have their first harvest in 2014. Rio said that by the end of 2014, he hoped the cooperative would be able to run independently. Meanwhile in Wamena, Rio estimates that it will take two years for their partners to be independent in terms of management. He said that if the local government could take part in transportation and distribution of the produce, Oxfam’s partners, such as Yapum, would be able to operate independently once their management capacity had been strengthened. In his office in Serui, Apolos Mora, the head of WMY cooperative said that for years vanilla trees grew in the wild in forests in Yapen. The Dutch brought the seeds when they opened coffee and chocolate farms on the island in the 1950s. “Before they [the Dutch] could teach the local people to cultivate vanilla, there was the transfer of power to Indonesia,” Apolos said. One day in 2008, Apolos was reading about vanilla in the bookstore and an “Aha!” moment hit him as he realized that these plants were the ones that grew wild in the forest. When Madagascar, the largest vanilla pod producer in the world, had poor harvests, the price of vanilla pods skyrocketed to Rp 3 million (US$309) per kilogram, Apolos said. Apolos then decided to cultivate vanilla vines and trained the farmers joining his cooperative to plant vanilla too. He sells the pods to Manado, where they are exported to Europe, the US, Australia and New Zealand. Recently, the price for dried vanilla pods was Rp 115,000 per kilogram. PDEP manager, Rio Pangemanan, said that Oxfam supported programs according to the characteristics of the area. The island and coastal areas are more developed than the mountain areas due to ease of access to other islands in Indonesia. The mountain areas meanwhile are more isolated. This results in a different variety of crops that can be profitable to produce. While farmers in Serui can sell their crops in Manado, in Wamena farmers can only sell locally. In Jayawijaya, Oxfam supports farmers revitalizing their sweet potato farms. Partnering with Yapum, they have developed 20 sweet potato collecting points in Jayawijaya that will distribute the crops to the markets in Wamena. Rio said that these collecting points had become a place for farmer’s advocacy and education to motivate the community to return to their farms instead of leaving for the city. Local NGOs such as Yapum and WMY cooperative say that it is not always easy advocating for farmers to cultivate vanilla beans or sweet potatoes. Farmers’ programs in Papua are often project-based, in which farmers are given money to open rice paddies or fishponds. Once the funds dry up, the projects become neglected. Eli Tabuni, the secretary of one of the sweet potato collecting points was one of the farmers who questioned the program. “This [sweet potato farming] is our culture, why are you making a project out of this?” he asked Yapum and Oxfam during their visit there. He said that many of the programs were only temporary and were not really helpful. Kiloner Wenda, Oxfam Sweet Potato project officer in Jayawijaya, answered Eli in the Lani language with another question. “Where are the young people now who will work on the farms?” he said. “If we don’t start now, then our culture will slowly disappear,” he said. Rio said that the projects aimed to support indigenous Papuan farmers in developing their business sense and opening their access to markets. In Wamena, women carrying their sweet potatoes from their villages to the market have to pay for transportation to the market for their heavy bags. Yapum encourages them to sell the potatoes for Rp 5,000 per kilogram, and they only need to drop their crops at the collecting points. This way, the women did not have to travel far to the markets and could save on transportation, Rio said. In Serui, the program has managed to attract young farmers, but in Wamena, whether the program will succeed in bringing the young back to the farms is yet to be seen. For the kids that like to play in the farm, their dreams are to be pilots and teachers, they say. But they will always love eating sweet potatoes. A mama walks barefoot under the skin-burning sun in a hamlet in Piramid district, Jayawijaya regency. With their traditional woven bags (noken) dangling from their heads, Papuan women, lovingly called mama-mama, dig into the earth to harvest sweet potatoes. Orina, 30, is one of the mama-mama. Last week was harvest time in her village, Yonggime. Carrying her 3-year-old-son Samuel to the field on her shoulder, she steadies the weight of her noken on her head. “It’s hard work,” she says. “We sweat a lot and we dig using shovels,” she said. The shovels that the women use are made from thin long metal with flat tips. Most tiring, she said, was that they had to carry their noken and their babies or toddlers with them to the field. Sometimes women carry three bags on their head, one for their offspring and the others for collecting the harvest. The bulk of the work on farms in Papua falls to women. Most indigenous Papuans in the mountainous highlands such as in Jayawijaya regency live from farming. Families grow sweet potatoes for their daily meals, as well as for their pigs. The rest, they sell in the markets. Women are usually the ones who travel to the markets carrying heavy loads on their heads. The sweet potatoes, or hipere in the local language, can grow as big as a newborn baby, weighing around 5 to 10 kilograms each. “Men open the fields, build the fences and dig irrigation channels, but that’s it. 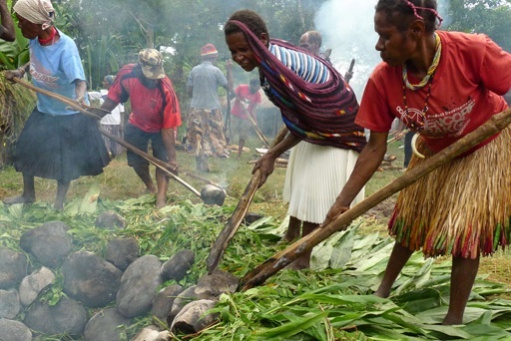 The people who tend the fields, plant and toil, harvest and feed the cattle, are the women,” Patricio Wetipo from the organization, Humi Inane (Women’s Voice) Foundation, said in Wamena recently. In Indonesia’s easternmost province, indigenous women are marginalized and often become victims of violence both from outside and inside their communities. The security approach in the restive province has seen many women suffer sexual violence at the hands of Indonesian Military (TNI) personnel, as documented in a 2009 study by the National Commission on Violence Against Women (Komnas Perempuan). Women are also second to men within their communities. Besides having a heavier workload, they were not included in decision-making in tribal communities, Patricio said. Polygamy and adultery was rife, he added, and with Papua being the Indonesian province with the highest rate of HIV/AIDS, a lot of women contract the virus from their husbands. Patricio said that his organization had documented 370 reports of violence against women in Jayawijaya alone. One can see the stark difference between men and women with the grieving customs of communities in the central mountains. Women in those tribes cut off the phalange of a finger as a sign of grief when a member of their family passes a way. The men, meanwhile, make only a tiny slice in the tip of their ears. The government has banned this particular practice, but one can still see many women with short, stumpy fingers, including younger women. But conditions for women are changing — albeit slowly; development programs that incorporate gender equality are opening up access for women to become community leaders. In Wamena, Sarlota Itlay, 42, stands out as the head of a farmers’ group in Musaima village, a position that she’s proud to hold. The single mother of four describes her position as “one that’s rare in Papuan custom”. When development NGO Oxfam started a Papua Enterprise Development Program (PEDP) in Wamena in 2009, the single mother joined the group of 55 farmers that opened 10 hectares for sweet potato cultivation. She was the only woman that spoke a lot during discussions with Oxfam and the Independent Business Foundation (Yapum), Oxfam’s local partner, she said. In 2010, she was appointed head of the farmers’ group. Her leadership caught the eye of the local Hubikiak district administration and she was appointed as the village secretary, giving her a role in the day-to-day administrative affairs. Rio Pangemanan, Oxfam’s PEDP manager, said that when devising programs to support entrepreneurship within indigenous Papuan communities, they ensure that women’s ideas and roles are clear. They separate discussions between women, men and community leaders to ensure that women’s aspirations are heard before planning the program. Patricio also uses this technique in his awareness-raising campaigns. “We talk with the women in the communities about women and men’s positions in customary law, whether there is violence or not and, if so, what forms of violence they experience,” he said. Patricio then talks with the men on the same topics. In the end, the men and women gather for a dialogue about women’s roles and violence against women in their community. Change was slow, he said, but women were becoming more confident and courageous in expressing their objections about things they felt were unfair. 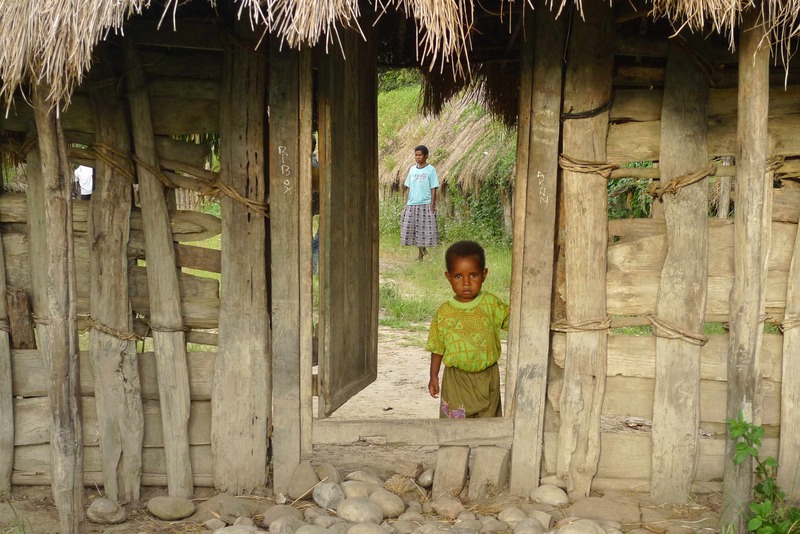 In Wamena, religious institutions are also playing a role in empowering women. In a Catholic boarding house for girls in Wamena, some 30 girls sit on a carpeted floor and discuss their rights as women. Led by Deacon John Jonga, a Catholic priest and human rights activist, the girls, who are in junior high and high school, shared their stories of how they felt having a lower status compared to their brothers. They also said they had to work harder on the farms during their school breaks compared with their brothers. Deacon John had the girls laughing when he cracked a few jokes about how hard it must be for them having been born girls. But he was very serious when he asked them what they wanted when they grew up. “Do you want to be the young wife of an old tribal leader?” he asked. “I know a woman who used her savings to pay the dowry for her husband’s new wife. Would you like that?” he asked. The girls giggled and shook their heads. Marcela Logo, 17, said that if her future husband treated her badly and had another woman, she would leave him. “You are worth it, you’re equal to men, and you deserve to be free from violence,” Deacon John said. The girls’ eyes grew wider, and an optimistic glint showed in their smiles. 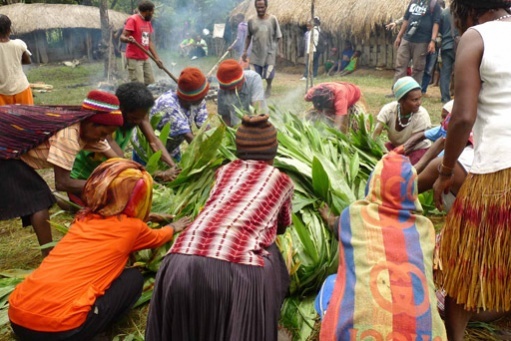 Returning to the land may be one way to improve food security and welfare in Papua. The Jakarta Post’s Prodita Sabarini was recently among a group of journalists invited by the Britsh NGO Oxfam to examine a few of their programs in Serui and Jayawijaya regencies in Papua. Below is her report. His red lips and teeth, reddened from chewing betel nuts for more than half a century, formed a smile as he finished his song. From Yapen where Serui lie to hamlets in the central mountains of Jayawijaya, traditional songs hold a deep meaning in Papuan culture. When reporters and NGO workers visited a village in Piramid district of Jayawijaya regency, Papuan men greeted visitors with tearful alments expressing their gratefulness of having guests from faraway places. The song that Seth sung has relevance in today’s Papua, where urbanization has taken some of the young away from the rural areas to the big cities, leaving the traditional farms neglected. As indigenous Papuans trail behind in education and economic power compared to migrants from Sulawesi, Java, or Sumatra, some young people who live in the cities end up turning to petty crimes or prostitution. A large number of residents have contracted HIV, sending the number of infected people to the roof. According to the Health Ministry, Papua has the highest number of HIV infections in Indonesia, recording 7,572 cases between 1987 and 2012. The Central Statistics Agency (BPS) said that urbanization in Papua has increased by 3.76 percent between 2000 and 2010, when 25.96 percent of the population, or 735,629 people, lived in cities, compared to 22.2 percent a decade before. In Papua, more than 70 percent of the people live from farming. Taking extractive industries out of the equation, agriculture contributed 25.74 percent to Papua’s gross domestic regional product (GDRP) in 2012. The mining industry in the resource-rich province contributed 46.52 percent to Papua’s GDRP in 2012, but absorption of local workers has been low. In 2010, only 26,747 people, mostly migrants, worked in extractive industries. In Timika, more than 70 percent of the population are migrants, according to the 2010 census. As agriculture holds an important role in the lives of indigenous Papuans, developing the local economy by empowering farmers might help realize their basic rights for sustainable livelihood, according to Rio Pangemanan from Oxfam, which has a number of programs involving farmers in Papua. Farmers and NGO workers in Papua report that a change of eating habits, with the introduction of rice as staple food from Java and with the government programs of rice for the poor, has jeopardized the self subsistence of villages and the livelihoods of young people in Papua. Jayawijaya Agriculture Agency head Paulus Sarira said that five years ago, 94 percent of the population consumed sweet potatoes as their main staple. “Now only around 16 percent of the people consume sweet potatoes. Some have turned to eating rice,” he told a seminar on food security in Wamena early this month. Chris Manuputty, the special assistant to the Jayawijaya regent for governance and social welfare, said that the unchecked change of eating habits from sweet potatoes to rice might lead to a food crisis in Wamena in the coming years. Petrus Wenda, 70, a farmer from Yonggime, a hamlet in Piramid district in Jayawijaya, is one of the local farmers who mourn the loss of young people from his village. In his sweet potato farm in the Baliem Valley of Jayawijaya, Petrus told visiting reporters that sweet potatoes were part of his culture. Small framed, Petrus became animated in telling the story of the benefits of sweet potatoes, or hipere in the local language. He stepped back and jumped over an irrigation ditch to better express his feelings. His voice became louder and his movements became more animated. “See my right arm? I can defeat five men with this,” he said while stretching his right arm. “See my left arm? I can defeat five more with this,” he said, reaching out his hand. Petrus then stretched his right leg and said “I can kick with this”, displaying how hipere made him strong and healthy. “Rice tastes good but it makes your stomach ill,” he said. There is a reason why Petrus is so passionate about sweet potatoes. According to him and other elders, the introduction of rice has made young people leave the villages for the city to earn money so they can buy rice instead of preparing their land for the women to grow sweet potatoes. “A lot of young people go to the city and become robbers. They live there [in cities] and they end up dead,” Petrus said. “Now young people don’t want to plant sweet potatoes. All of them think they can make money in the city. In fact, the money is here,” Petrus said. I’ve always wanted to go to Papua, ever since I read an opinion piece in The Guardian by exile Papuan independence leader Benny Wenda two years ago. It’s such a faraway place from where I grew up and the tales that have been told to me is also so far from the reality there. When I finally set my foot to Papua, the land that people call a piece of heaven on Earth, I was mesmerized by its beauty. The layers and layers of undulating hills and valleys covered in mist was like out of this world. But, it’s a sad place too, the people witness and suffers from violence from the military and injustice from the Indonesian government. I’m Indonesian, Javanese, but when I traveled to Papua, I question the insistence of the government for a unified Indonesia, when it takes away the right to self-determination of peoples. How come an imaginary line be so important as to keep people in chains? Going to Papua, I felt like traveling to time and space, to Java in Colonial times, when all the people despised the Dutch Colonial power and yearned for freedom. But then, it all makes sense why they want to keep that imaginary line, to be able to take away what they wouldn’t be able to take if the line disappears. For Papuans, their graves are a reminder of the grief that besieges their land. In front of the Justice and Human Rights Advocacy Network office in Wamena is the grave of Opinus Tabuni, a member of the Papuan Indigenous Council, killed in a military crackdown on World Indigenous Peoples’ Day in August 2008. Human rights activist Theo Hesegem sat just a few feet from the grave. He recently said that the government’s attitude to the complex social and political problems in Papua would not end the violence. In 2011, UP4B was established to accelerate development and growth in the most impoverished region in Indonesia. The hope was to improve the welfare of indigenous Papuans and quell their discontents. But the source of discontent is not about having food on their plates. Theo said that Papuans’ main problem “is not eating and drinking. It’s not about welfare. We don’t know how many children, how many families, how many people have been shot or killed — that’s the problem”, Theo said. Researchers at the Indonesian Institute of Sciences (LIPI) believe that decades of political violence has led Papua to a collective memory of grief, or memoria passionis. While the government attempts to speed up development in the region, it retains a military approach. In 2009, security forces killed Free Papua Movement (OPM) leader Kelly Kwalik, and despite of his death, sporadic attacks from the OPM continue. 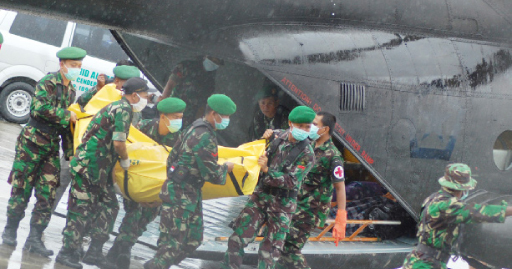 According to the National Intelligence Agency (BIN), last month’s ambush was partly due to rebel fighters unhappy with a new military district command (Kodim) in Puncak Jaya. “People can’t assume that the issue of Papua is finished. It’s about ideology. You can’t shoot a person and say his ideology is dead. There are other people. That person has children who will continue to think that ‘my father was shot because of Papua’,” Theo said. Melianus Wantik, 29, member of the National Committee for West Papua (KNPB) which campaign for secession from Indonesia, said that the grave of They H. Eluay, the assassinated leader of the independence movement the Papua Presidium Council, was an important place for KNPB. Young activists in Papua established KNPB after Theys was killed. During the founding of KNPB Melianus said they camped at Theys. KNPB members themselves are now on the police wanted list, accused of shootings and bombings. KNPB leader Victor Yeimo reports that 22 KNPB members were killed last year, including the KNPB leader Mako Tabuni. 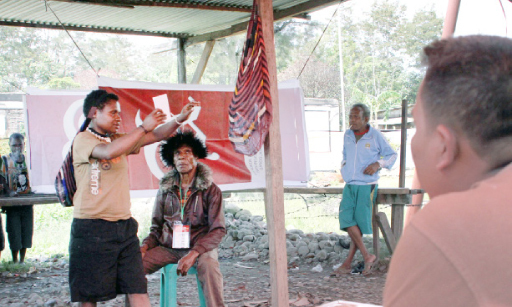 For Papuan Indigenous Council (DAP) Baliem area head, Yulianus Hisage, the killings no longer have a shock effect on him. “Killing people, shooting people in Papua: It’s normal. For us, the indigenous community, it’s normal because it’s not the first time we’ve seen it,” he said. Yulianus, who is part of the Jakarta-based conflict resolution NGO, the Titian Perdamaian Institute and often travels outside of Papua, does not feel safe in his own land. “When I leave Papua, for Yogya I feel safe. Back in Papua, I worry when I will be killed,” he said. Papuans have been allowed to reject secrecy as one of the principles of general elections. The open-ballot system is permitted there, but customary leaders say the open election system as it stands in Papua today has no roots in tradition and could easily cause conflicts in the already restive province. The heavily militarized province held its gubernatorial election on Jan. 29 using open ballots. Known as the noken system, its name is taken from the traditional woven bag that replaces the ballot box. During the election that saw Lukas Enembe and Klemen Tinal victorious, voters in Papua placed their ballots in one of several noken. The number of bags corresponds to the number of candidates. The bags are hung in the open for all to see. “It’s a dangerous system,” Damianus Wetipo, a polling station official in Asolokobal, Jayawijaya said. He said that lack of secrecy meant that village or customary leaders were able to pressurize their people to vote according to his choice, and if there was any defiance, people could end up fighting each other. The Constitutional Court (MK) recently rejected a lawsuit against Papua General Elections Commissions (KPUD) by five campaigns in the Papua gubernatorial race. They claimed that fraud had been widespread in the election and that the noken system was undemocratic. Under the 2007 Law on General Elections, the principle of secrecy is part of elections, along with elections being direct, public, and free. However, MK judges ruled that the noken system was not a violation, stating that it was part of the Papuan culture. Traditionally decision-making in Papua has been a collective consensus, in which the tribal head can be a proxy for his tribe. The noken system was invented to translate this to modern election practice, where every citizen has suffrage. Each citizen is expected to place the ballot themselves. The Papuan Indigenous Council (DAP) Baliem region head, Yulianus Hisage, said that the noken system was unknown to their tradition. Damianus said that the noken itself was part of their culture but having people choose a bag to place a vote, to and thereby choose their leader, was not. Damianus said that Papuans, many in rural and isolated areas, have been used to the ballot box in elections for a very long time. He recalls that the noken system was first used during the first free presidential election in 1999 after the New Order authoritarian era, but he was unsure of the reason for the change of system. The village officials said that the system holds a huge potential for inciting conflict. In regency elections, Papuans can become fanatical and very belligerent in their support of their candidates. Indeed, it is not just in the regency elections that violence can flare up. During the gubernatorial election the system took its toll. Tolikara regency councilor Husia Yosia Karoba from the Golkar Party was beaten to death by Democratic Party supporters, the winners of the election. Husia reportedly urged people to vote for the Golkar candidate. The open system is not the only problem with Papua elections. The Democracy for Papua Alliance (ALDP) reported electoral fraud in the handling of leftover ballots. The fixed voter’s list was, they claim, higher than the actual number of voters. This challenge was echoed by five candidate pairs and went all the way to the Constitutional Court. The court explained that the number of eligible voters was based on a census by the Papua Population and Transmigration Office. ALDP reported that in Hesatum village the number of ballots was around 300, while the actual village population was 138. The village officials then confirmed the inflation of the voter list. Damianus knows all the people living in his village, but the names in the list included people from a neighboring village and those who had passed away. “Rocks and trees were given a name and put on the list,” he said jokingly. The unused ballots were placed in Lukas and Klemen’s noken, who eventually won. Village heads say they were pressurized to cheat as the regency has power over their positions. Moreover, defying the directives runs the risk of having their children unable to get jobs in government. Most educated indigenous Papuans look for jobs in the public service, which creates a dependency on the whims of political elites.